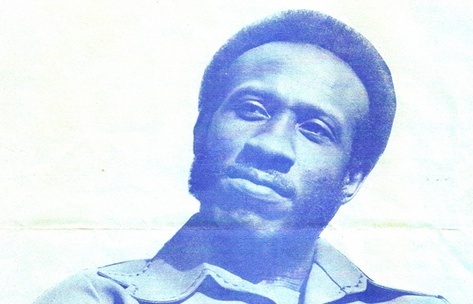 Lew Kirton (b. 1948) grew up in a religious household in St. Michaels in Barbados. Llewellyn Randolph Kirton as he was born began singing in St. Cyprians choir as a kid. Despite his parents aversion to secular music he continued to want to sing outside of church from age 12 – even when it meant to sneak out of the house to do it. He went from the Starlighters, Draytons 3 (which after Kirton left became known as the Draytons 2), recording with Barbados’ most popular r ’n b outfit Blue Rhythm Combo, drumming with Sam & Dave to a solo career. For a kid who was nicknamed ”Jiggs”, after the skinny and bowlegged British cartoon of the same name, Mr. Lew Kirton has an impressive stature in both music and real life. What was your first recording? My first recording was a song by the Platters, written by Buck Ram. It was called ”Love Of A Lifetime” and with that song I won the first and only Jaycees talent competition at Kensington Oval in Barbados. The flip side to that 45 was a song by Joe Tex called ”Hold On To What You’ve Got”. I did two different 45’s while I was still living in Barbados. You later recorded with the BRC? What can you tell me about them? Blue Rhythm Combo was good! They were one of the finest and most versatile bands in Barbados but times were changing from guitar combos to the band era so they needed a lead singer. That’s how I got into the group. BRC recorded a song called “Sign Of The Times”. The other side was ”What About You” which is a song I wrote and sang. The great Jackie Opel made a career for himself in Jamaica but he originally came from Barbados. He went back home in the late 60’s. What was Jackie Opel like? He was kind, fun loving and a great performer. He was always my friend and I never had a problem reaching Jackie at any point. Jackie lived in the Bayland area of Bridgetown in Barbados. He was a street guy. He grew up in the street just like I did. The Jackie Opel I knew was always the kind guy – a good guy to me. 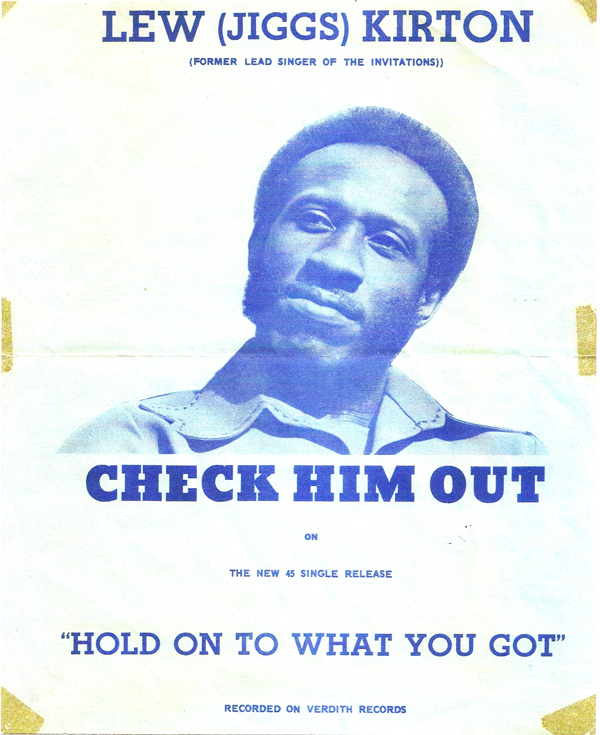 Once he resurfaced back into Barbados after having stayed in Jamaica for quite some years I did a couple of gigs with him. We always had fun. A lot of people say he was the best performer ever to come out of Barbados. What made him so great on stage? I think it was the people that he looked up to. The Jackie Wilsons and the James Browns… the artists who were peaking at that time. They were also two guys in Barbados. They were good singers and great dancers. Vere & Vern. Jackie kind of emulated them and took it to another level. He had a high tonality and he always sang kind of like a Jackie Wilson. The key to Jackie was that he had traveled and he had seen things we had never seen. He could take any song and turn it into something special by putting his own spin on it. If you were coming after or before Jackie at a show you could forget about it! It was all over! Jackie would dominate the whole show. He was one of the most loved entertainers in Barbados. You left Barbados in 1967 for Canada. How did you end up in there? My sister migrated to Canada before me. She promised our Mother that she would eventually send for her two brothers, Edward and myself. My brother refused to go. My sister arranged for me to attend college in Canada. She also told me “I know you like to sing so I booked you on a talent show called ’Take a Bow’”. My sister made a great mistake though. She called to say that my papers were in and schools started in September. When in Canada I won the Take A Bow talent contest. As a result of that I persued a music career fulltime and delayed college. I stayed for two years in Ottawa, Canada. 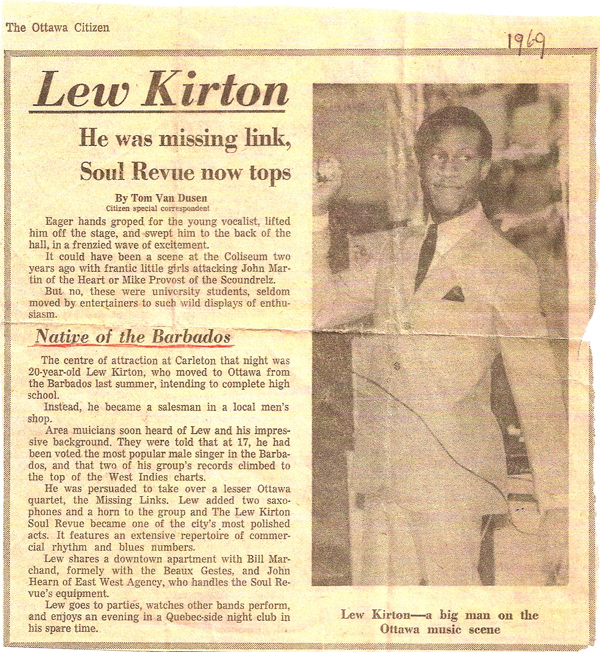 I had a band called The Lew Kirton Soul Revue. The band played college gigs and nightclubs all over Canada. In Montreal while on tour I met a Trinidadian jazz keyboard player. He invited me to New York to be a part of a label he was about to formulate. This was 1969 – 1970. I came to New York and worked with him and Carlos Malcolm but it did not come to fruition. I did cut some music for his label called AJP. So you were in New York with no record label. How did you get a break? I started to do some clubs around Brooklyn. I met this gentleman named Gene Goldstein. He was booking artists like Millie Jackson, Wilson Pickett, Joe Tex… He was also a number runner but really a true gentleman. He always dressed well. Gene owned a club called the 521 Club. He heard me sing and he was very impressed. He became like my dad after that. I could work for Gene at his 521 Club in Brooklyn anytime. He really looked out for me. Gene knew a couple of club owners and I would eventually perform at many of these clubs. Sometimes I was doing three gigs a night at these clubs. That’s what I did initially. I went around to these little clubs and the word would spread around. As you mentioned earlier then you ended up playing drums for Sam & Dave. How did that come about? I was at the 521 Club in Brooklyn and Ajax, a trumpet player I had met gigging around, called me to inform that Sam & Dave needed a drummer. They were in Toronto at the time. I got on the phone with Mr. Brown who was the manager for Sam & Dave. I accepted the gig and was ready in Toronto in six hours as required. I traveled with Sam & Dave as a drummer throughout the US and Europe. At one point I was the bandleader but I always wanted to pursue my personal career. But you joined the group the Invitations after Sam & Dave and before going solo? I was actually not interested in group performances. I wanted to attack this thing on my own. Around summer of 1973 I was at the 521 Club and these four well-dressed gentlemen came through the door. They were looking for me. The Invitations had a record deal with this gentleman Joel Diamond and his Silver Blue Records. Joel liked two of their songs that he wanted to hear me sing. Next thing you know I’m in the studio with the guys and MFSB recording. We released ”For Your Precious Love” which was originally by Jerry Butler but it was not really taking over the country. Then a DJ in Miami, Florida, flipped the 45 and played They Say The Girl’s Crazy” and that was it, brother! (Laughs). The song became a Top-10 Billboard record. It was that big of a hit? It took off and we traveled the country. We were on shows with the likes of Bobby Womack, the Temptations and other groups. We did TV Shows and everything. We were together for around four years when we started experiencing conflicts with members who were unavailable to make all scheduled gigs. Some in the group didn’t want to leave their day jobs. It caused problems for me since I wanted to keep on working. I said I can probably do this better on my own and left the Invitations to pursue a solo career. Joel Diamond grabbed me and took me to Henry Stone of TK Records in Miami. You released some 45’s on different labels during this time but how come it took so long to follow up with a solo album after your great 12” “Heaven In The Afternoon”? I believe it came out in 1978 and you didn’t release your first solo album until around two years later. I took some time out. I was beat up! I spent three years in LA. It seemed like no matter what label I went to I had problems. I was in this fight all by myself. I was down and an old friend, came and got me. He felt I needed to relax. I wasn’t strung out or anything like that. I was just confused why none of these labels would pay me. I still had bills to pay and I still wanted to continue with my life. Mentally, I was down in the dumps for a couple of years. A lot of people from your generation weren’t able to adjust to the disco sound. You on the other hand seemed to go smoothly from more classic sounding rhythm ‘n blues that you played earlier in your career to the disco sound of the late 70s. Was there a reason for that would you say? This is where the versatility I learned in Barbados came into play. I was able to adjust with ease because in my early years playing with Blue Rhythm Combo we were covering Jazz, Pop, Rock and Reggae in the hotel circuit in Barbados as well as gigs around the island. You shared label with Otis Reddings sons in The Reddings as well as Tyrone Brunson for a while around 1983 at “Believe in Your Dream”. You released your second solo album “Talk To Me” on Believe in Your Dream. Who owned that label? You eventually started your own label, Tweedside Records, named after where you grew up in Barbados. In 1986 you released “Don’t Wanna Wait”. You worked with Binky Brice on it. What can you tell me about him? Binky Brice played guitar on the ”Talk To Me album and also on the Melba Moore album ”Read My Lips” where I co-wrote a song called ”I Can’t Believe It’s Over”. He’s a really great guitar player. Anyways, Binky and I myself wrote and produced ”Don’t Wanna Wait” which also picked up by MCA Records for the UK market. Your mother had a hard time getting used to the idea that her son was a musician. Did she ever come to terms with it before she passed away? I loved my Mother and I do understand the reservations she had about the music business. Some of it is true as evidenced by some of the challenges I encountered through my career. When I became the first Barbadian to be on Billboard with the album ”Talk To Me” my mother was very proud of me. The Tourist Board asked me to perform in Barbados. I think she just had motherly reservations and wanted the best for me. I think she learned to respect my decision. She died on me before I could go back and buy her a house. If anything bothers me to this day then it’s that I wasn’t able to do that. Lew Kirton now lives outside of Philadelphia. His latest CD entitled “So Into You” came out in 2010 and can be bought through cdbaby.com. January 8th, 2011 Lew Kirton received a lifetime achievement award at the Barbados Music Awards. Lew I’m happy to hear you stayed in the game. I wish you well as well as Binky. David McRae and I ended up as members of The Drifters featuring Rick Sheppard. I left the group and moved to Arizona. Take care Mel. Dockie Roberts Guitarist Singer , Blue Rhythm Combo .